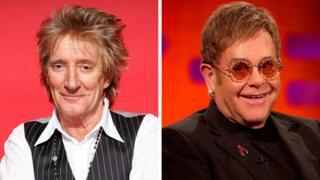 Sir Rod Stewart has given his scathing view on Sir Elton John's retirement tour, saying it "stinks of selling tickets" and is "not rock and roll". Speaking to US chat show host Andy Cohen on Bravo TV, Sir Rod said he did not believe in retirement tours. "I've never spoken about it and if I do retire, I won't make an announcement. I'll just fade away," he said, adding that retirement tours were "dishonest". Sir Elton, who announced his farewell tour in February, hasn't responded. Sir Rod was responding to a question from a caller on Cohen's Watch What Happens Live, asking what he thought about his fellow pop legend's tour. He responded: "Well I did email her [Sir Elton] and said 'what, again dear?' But I didn't hear anything back." He added that when people made "a big deal" about announcing their retirement, it "stinks of selling tickets". Sir Elton first announced his retirement from performing in 1977. In February, he announced he will finally say goodbye to fans with a series of 300 dates spanning three years. "I always thought I was going to be like Ray Charles, BB King - on the road forever," Sir Elton said. "My priorities have changed. We had children and it changed our lives. That doesn't mean to say I'm not going to be creative. But I'm not going to travel." Sir Elton's representatives have not responded to a request for comment.